Photo View Postcard. Multi. Cardstock. 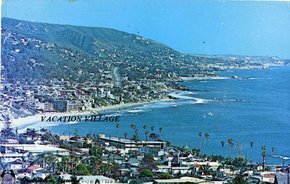 This glossy, full-color, photo card is titled, "The enchanting seaside community of Laguna Beach, Calif. And resort hotel Vacation Village. It is marked, with a K-diamond logo (Koppel Co.) and L. E. Lang Publications, Laguna Beach, Calif. With logo. Unused.